Recently, California’s Office of Environmental Health Hazard Assessment (OEHHA) has listed Monsanto’s Roundup herbicide as known to cause cancer [no new news to SF]. The San Francisco Bay Are has long been a pioneer in urban environmentalism. Gone are the days of plastic bags, plastic water bottles, GMO’s and Styrofoam …. San Francisco Businesses have joined the Eco-Friendly train. And S.F. Government Departments are required to buy from an approved list of environmentally preferable, products. The San Francisco Municipal Transportation Agency [SFTMA] or MUNI is made up of a fleet of biodiesel-electric hybrid buses. The San Francisco’s Hotel Industry has implemented linen reuse programs; 100 % non-smoking policies; compost food waste; use of compact fluorescent lights; and the use of nontoxic cleaning products. Within S.F,’s “7 x 7” is the largest City-owned solar installation in the USA, a 60,000 solar array atop Moscone Center. 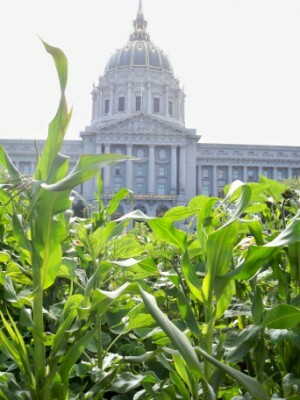 The seasonally-driven organic produce, farmer’s markets, non GMOs stores and healthy restaurant choices make the San Francisco Bay Area a eco-friendly place to be … . And to top it off, San Francisco is equipped with 82 miles of signed bike routes. 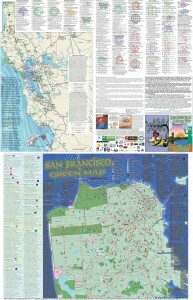 So if you’re looking to become “greener” – Check out the San Francisco Businesses Green Map – a single information resource of local Sustainable Businesses & Green resources.